Jessie Cope Miller (center) as Sheila with the company. Miller also served admirably as the evening’s choreographer. 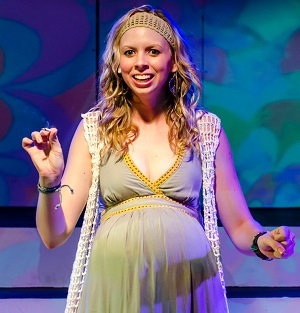 This past weekend I saw Blank Canvas Theatre’s production of Hair. The score by Galt MacDermot, Gerome Ragni, and James Rando follows no conventional rules of musical theater and is all the better for it. The story is almost nonexistent and spottily told, but the last ten minutes are deeply moving and haunting. I was pleased to see two ensemble members from Cain Park’s recent production of The Frogs have more showcased roles roles here, and the cast contained many other performers who I hope again to see in future area productions. So it’s unfortunate that I walked away thinking less about them and more about the evening’s many sound-related issues. There was frequent hissing and distortion, and a couple ear-splitting moments of feedback. However, there were also large parts of the performance where everything worked as it should (especially gentler numbers like “Air” and “Frank Mills”, which were finely rendered by Becca Frick and Neely Gevaart respectively) and a few performers (notably Scott Esposito’s well-sung and crisply enunciated Claude) who managed to make themselves heard regardless of the circumstances. There were also times when the blame for mumbled lyrics fell on the cast and not technical difficulties. 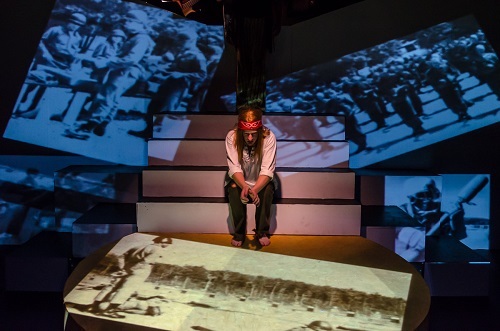 Scott Esposito as Claude surrounded by Perren Hedderson’s projections. 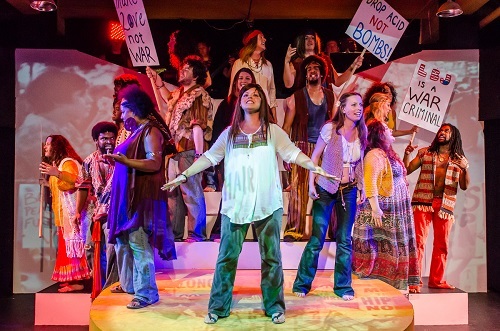 Hair was far from the first Cleveland production I saw with greatly flawed execution of sound design–I’ve witnessed notable issues in productions at all the area’s professional and semi-professional theaters. And I’m certainly sympathetic towards the challenges Hair faced. The space is cramped, the band is loud (it IS a rock musical, after all), and the large cast rarely leaves the stage (leaving few opportunities to clean or swap out a bad mic). Patrick Ciamacco is BCT’s Artistic and Technical Director and for Hair is credited with direction and designing both set and sound. The fact that he has no bio listed in the program of the company’s website leads one of presume he wears so many hats not because of relentless ego, but because “if you want something done you have to do it yourself”. His smartly practical set featured multiple levels, entrances and playing spaces to keep the action flowing in the tight quarters of the theater while also providing many surfaces for Perren Hedderson’s effective projection design. But the space required the same kind of problem-solving in its sound design as it had in its scenic. From what biographical information I can find on Ciamacco, his background is in acting and sketch comedy with his technical acumen apparently self-taught. (And considering how many highly skilled and intelligent theater technicians I know who refuse to have anything to do with sound, his willingness to try is admirable, even if the results were truly calamitous.) If what Hair needed most was an excellent, resourceful sound designer, the eighteen months of shows I’ve heard in Cleveland indicates such expertise is a serious and problematic rarity on the “North Coast”.